The safety back-up device is available as a software and wiring update on all Range T, C and K trucks with electronic park brakes. In the event of the driver’s door being opened at speeds of up to 1.8mph (3kph), the device activates the park brake automatically. The HSE has again recently highlighted the dangers of runaway vehicles. In a review of a fatal incident in Kent in 2014, it identified that the driver’s failure to apply the park brake had resulted in a road worker becoming trapped between the trailer and another vehicle, causing his tragic death. Renault Trucks’ solution is to create a ‘fail-safe’ which can operate in two scenarios at speed below 1.8mph. In each case the Range T, C and K’s electronic park brake utilises the extensive functionality of the vehicle’s electronics systems to make the Anti-RAPB innovation possible and to communicate the system’s status to the driver through the dashboard ‘tell-tale’ messages. Scenario one is when the truck is in neutral, the park brake is not applied and the driver’s door is opened. Here, the ‘door open’ buzzer will sound momentarily, followed by the application of the park brake and the message ‘Park Brake Applied’. In this case, upon closing the door and selecting drive, the park brake will auto release when pulling away. The second scenario is when the vehicle is in gear, the park brake is not applied and the driver’s door is opened. The door open buzzer will activate, followed by the application of the park brake, with the message ‘Door open. Select Neutral position before leaving vehicle’. 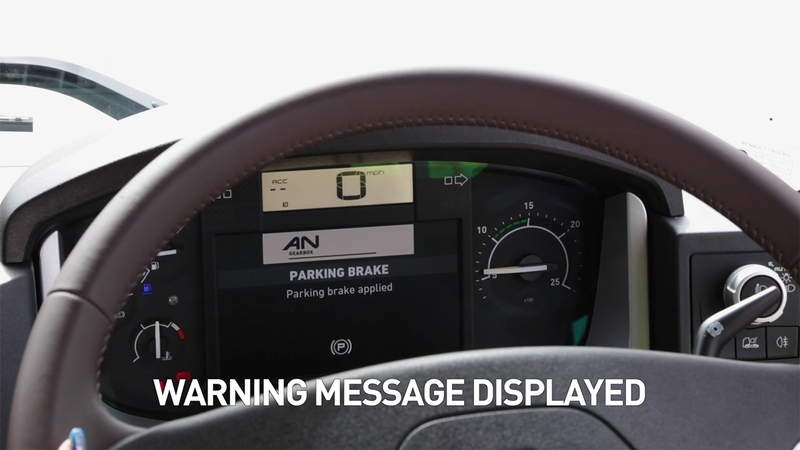 If this message is ignored, when the door is closed the park brake will not auto release when pulling away, so the driver must either select neutral and return to drive or manually release the park brake.